First cut a 6" x 9 1/2" piece of purple card stock and fold it in half for the base, a 4 1/2" x 5 3/4" piece of orange for the first layer, a 4 1/4" x 5 1/2" piece of black for the second layer, a 4" x 5 1/4" piece of patterned paper for the front layer, a 2 1/2" x 3 1/2" piece of black for the image's first layer, a 2 3/8" x 3 3/8" piece of purple for the image's second layer, a 2 1/4" x 3 1/4" piece of white for the image, two 1" x 4" pieces of patterned paper for the banners, a 7/8" x 1 3/4" piece of black for the sentiment's first layer and a 3/4" x 1 5/8" piece of purple for the sentiment. Next cut the banners with Stampin' Up! Hearts a Flutter Framelits dies and attach them to the front layer with mini pop dots. 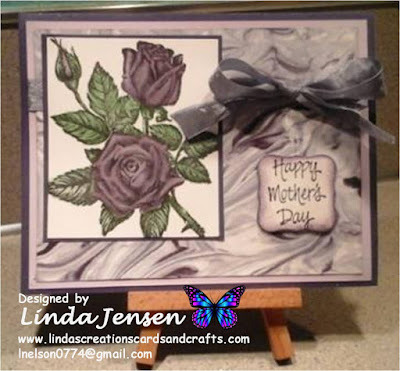 Next using a Stamp a ma jig stamp the sentiment on the small piece of purple card stock in Stazon Jet Black ink, attach the purple piece to the black one, then attach the black one to the front layer with mini pop dots. 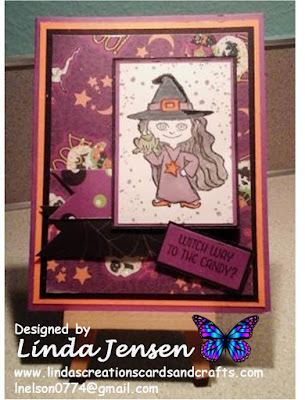 Next stamp the witch on the white card stock with a Stamp a ma jig and Stazon Jet Black ink. Then carefully stamp the dots around her in Stampin' Up! Perfect Plum ink with a stamp from the Stampin' Up! Gorgeous Grunge set. Next color the witch's hat and hair with black and white American Crafts Galaxy markers, her costume and hat's belt with Perfect Plum ink and an aqua painter or blender pen, her shoes, necklace, and hat buckle with Stampin' Up! Tangelo Twist and the frog with Stampin' Up! Always Artichoke ink. Then attach the witch to the purple layer, the purple layer to the black layer, the black layer to the front layer with mini pop dots, then the front layer to the black layer, the black to the orange, then the orange to the base and enjoy!